Do you dread this question? You are busy taking care of kids, animals and the house all day. Dinner time rolls around and you become panicked because you aren’t sure what to feed your family. You don’t have a plan! Today I would like to help you find a way to make a meal plan that works for you. I want you to be able to plan and prepare healthy meals for your family everyday. Life is easier when you have a plan! First of all, I want to say that I didn’t come up with this plan on my own. 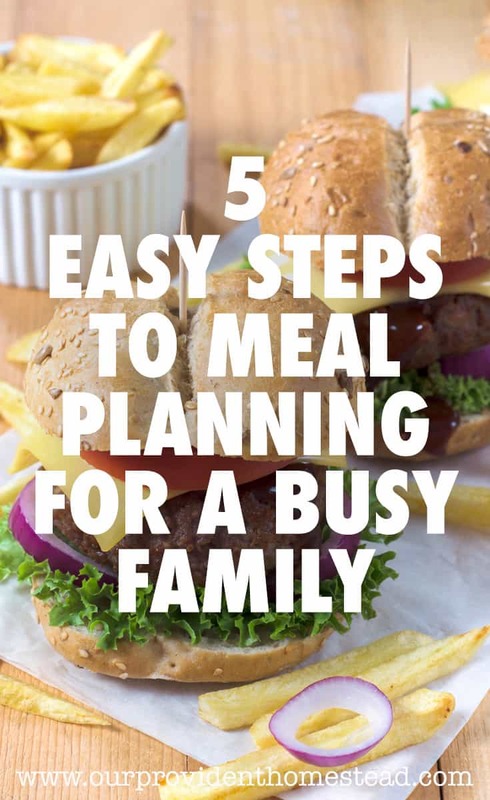 I researched and tried many different meal plan ideas on blogs and in books before I came across this one that works for my family. There are meal planning solutions all over Pinterest, from chalkboards to whiteboards to binders. You can check out this board for more meal planning ideas. I found this plan here and it has been a lifesaver! 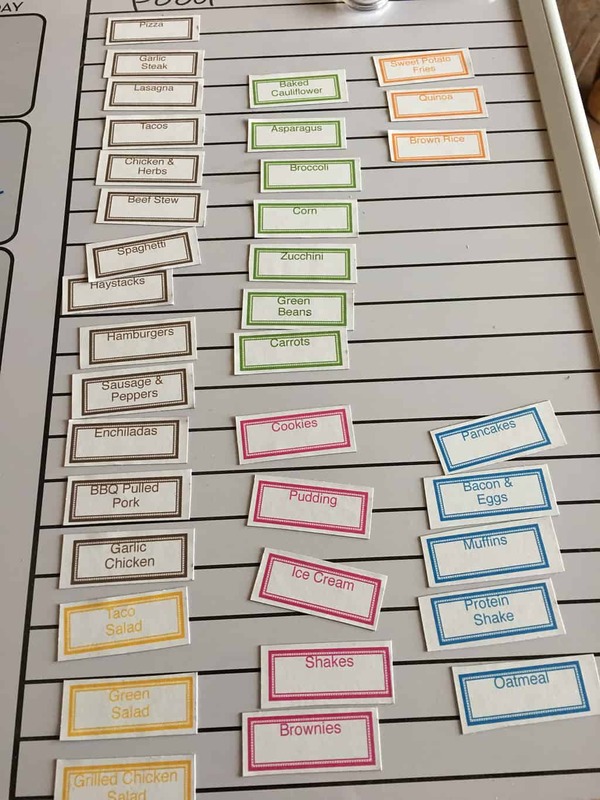 You can either type your meals or print them on the magnets. Once you have these materials (or something like them), you move to the next step. . .
What are the go to dinners that your family loves? For this plan to work, you need to come up with 14 dinner meals that you family loves to eat and you know how to make. In the beginning, I would not choose random recipes that you saw on Pinterest with weird ingredients or long instructions. I want you to choose meals that you are familiar with and that you family likes. You can theme your meals if you would like. Some people think it is easier to have a mexican night, italian night, chicken night, beef night, pizza night, etc. If that works for you, great! Once you have made a list of 14 meals your family loves, then make a grocery list for those meals. You want a list just for these meals. That way if your are in a rush for the store one week, you can grab this list and you know you will have all of the ingredients for two weeks of meals ready to go. Check and see what you have on hand before you make your grocery list. 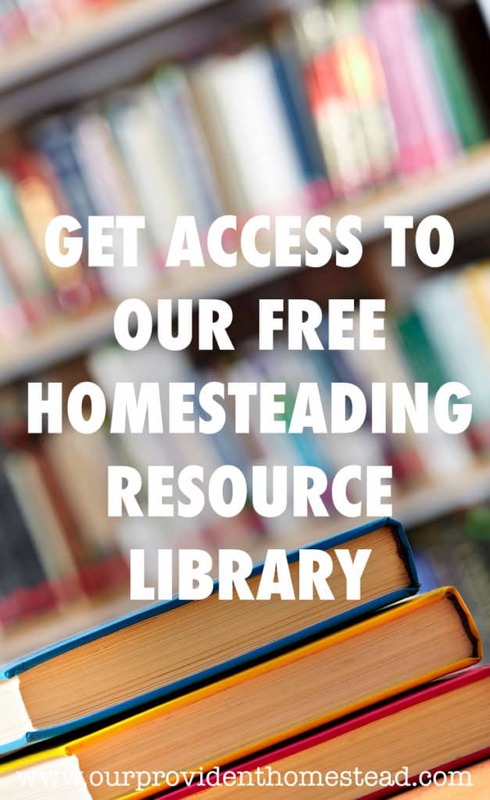 You have to know what you have on hand so you can save money by using those things first. Check the sales flyers of the store you are grocery shopping at and see if they have something on sale that you need for your list. If it is a good sale, you might want to stock up on it now and use it in future weeks. If you need ground beef in 3 meals, buy a 3 pound package (or how ever much you need) and split it up later. Usually bigger packages of meat are cheaper by the pound. You can do this for veggies and other things to. If you are going to be making these meals twice a month, it might be a good idea to stock up on larger bottles of seasoning to save money. Don’t forget to plan a side dish (or 2) to go with your main dish. The next step is to get out your calendar and fill in the days for this month. Check your schedule for the events that are going on this month. Do you have a potluck at church, or are you going to be out of town for a few days? Fill in those days first so you know which days you actually have to plan a dinner for your family. Fill in the days you are going to be cooking dinner with your 14 meals. You may try to have a leftovers night once every week or two weeks. Maybe pick a night that you know you aren’t going have time to make dinner because your kids have a sporting event or school play or whatever. If you feel like your family might have a problem with eating the same 14 meals every 2 weeks, then add one new meal each 2 week rotation. If they really like that meal, you might want to substitute it for a regular meal the next month. The list should be flexible, but predictable enough that there are mostly meals that you could make without thinking very much about it. 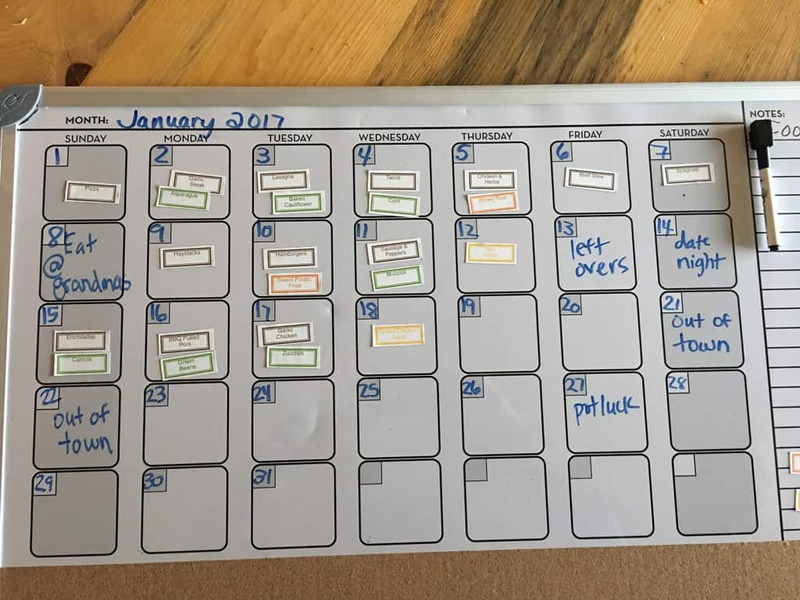 After you finish using your magnets, you can rearrange them again to fill in the rest of the month. Keep your 14 meals list and your grocery list somewhere you can access it often. This could be on your computer where you can print it out, or in a binder if you prefer it that way. You just need to be able to copy it for the next time you go to the grocery store. 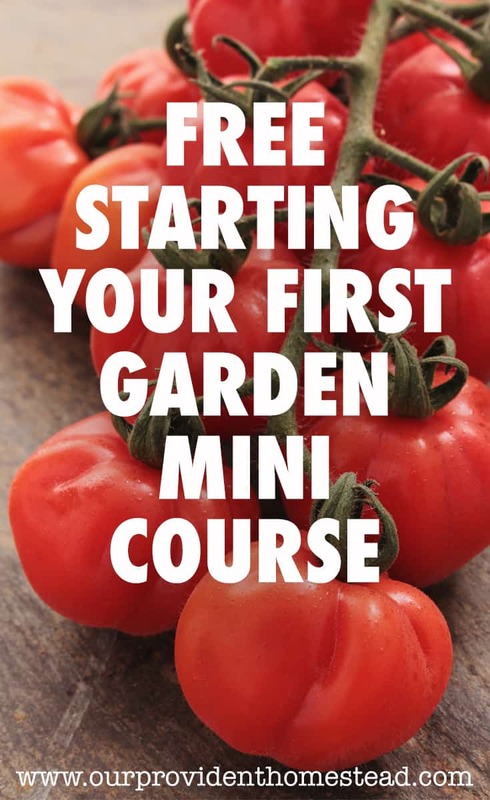 Substitute things from your pantry or garden to use what you have first. That could be the meat from hunting, produce from the garden or something that you stocked up on that was on sale last month at the grocery store. 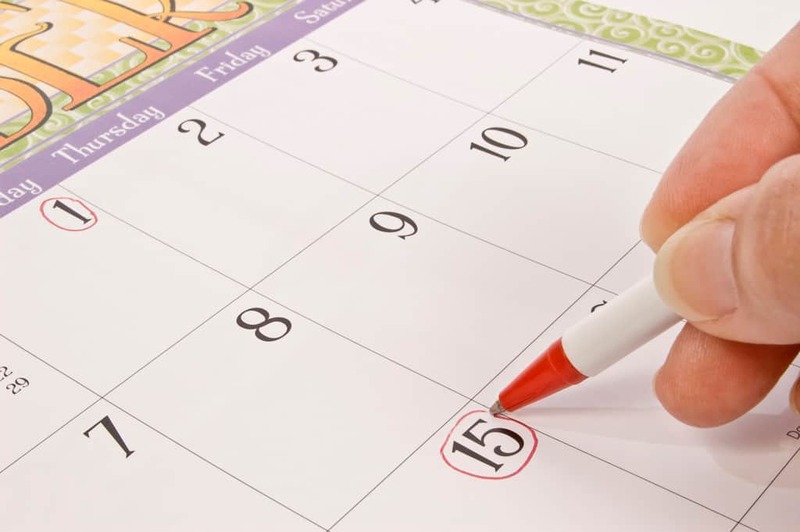 Look at your meal plan calendar the night before and check to see if you need to thaw something for tomorrow’s meal. If you do, put it the refrigerator then so it will be thawed the next afternoon. To save time, you can batch cook your meat ahead of time so that it cooks faster at meal time. You can also chop veggies at one sitting for the whole week and put them in the fridge for fast prep work later. Freezer meals are amazing for meal plans. You can take a Saturday to make 8 freezer meals and then you have meals that are ready to throw in the crock pot on busy days. No Cook Freezer Meals by Kelly McNelis @ www.newleafwellness.biz is an awesome resource for nutritious, no cook freezer meals. If you have an Instant Pot/Electric Pressure Cooker, it can make such a difference at meal time. I wrote a blog post about it here. If you have the ingredients ahead of time, all you have to do is pop them in the pot and you can have a warm meal in less than an hour. Some people plan every meal-breakfast, lunch and dinner. That is up to you and how rigid you want your meal plan to be. If you have a stocked pantry of breakfast and lunch items, then you may just want to let each person make their own breakfast or lunch. Why Is Meal Planning Worth The Time? 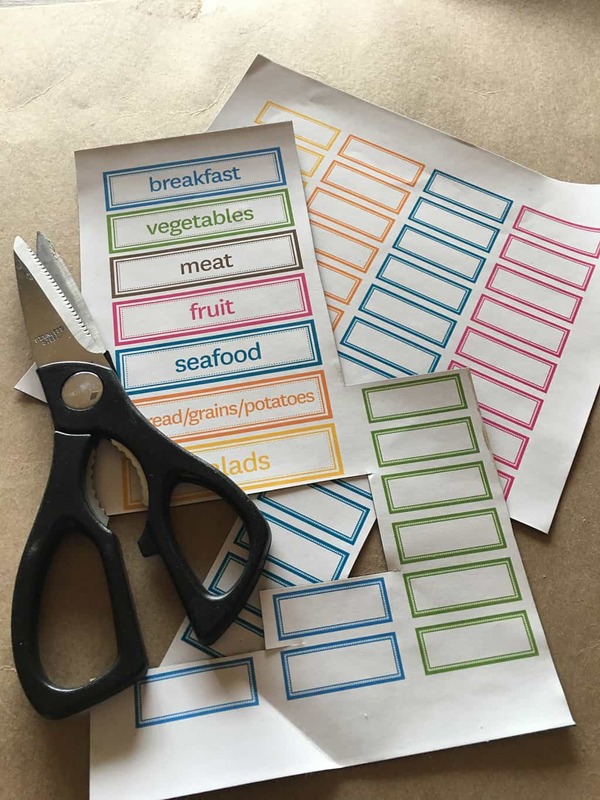 Each family’s meal plan is going to be different, depending on their schedule and the foods they like to eat. The main idea of meal planning is to make a list of your favorite meals. Write them on the calendar for the day they will be dinner. Make a grocery list for the week (or two if you prefer). Have your pantry stocked with the foods you need for these meals. Check the calendar the night before to see if anything needs to be thawed. In the morning, put your meal in the crockpot or in the instant pot in the afternoon. Enjoy your homemade, nutritious meal with your family. Be less stressed at dinner time. Spend more time with your family and doing the things that matter most to you. Do you have a meal planning system that works for you? Please let us know in the comments below.